Welcome to LPNOW, where you can choose from thousands of SEALED, new vinyl LPs. Most of the titles are cutouts. LPNOW is run by Harvard Square Records, Inc. We've been selling VINYL from Harvard Square for over 25 years but we are in Austin, TX now. You can buy that hard to find vinyl right here on the Web, from our secure server. This site will feature selected titles from the 50,000 titles available to us. LPnow.com will always be more update than any of our printed catalogs. 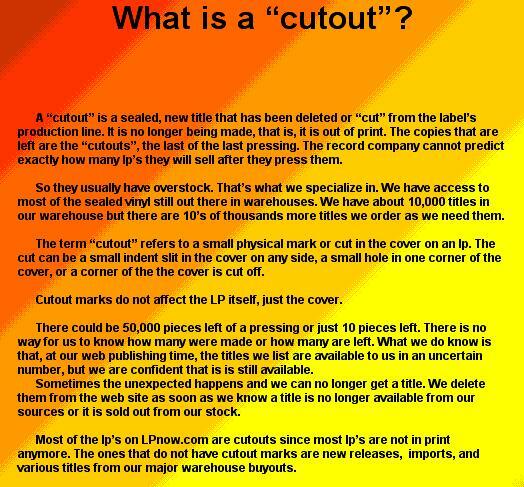 There is no current vinyl catalog due to printing and postage increases. You can always email us with LP requests. If you have one of our older catalogs(1999 was the last one), you can still order from them. Prices have changed and many are sold out. Import Prices are subject to change without notice. This is due to currency changes in the US Dollar in other countries' currency. Our 2001 out of print CASSETTE catalog is our last cassette catalog. You can still order from it. We update the site regularly with New Listings. Keep checking back. The info page has all of the shipping information.